Ozonesonde launched to measure ozone levels up to 20 miles above the Pole. Science news circulates and recirculates. Sometimes the report focuses on something that suggests the need for further investigation. That is certainly true with most climate science reports. This 2017 report says that the hole in the ozone layer is the smallest since 1988. In September 2011, NASA measured the maximum extent of the hole at 7.6 million square miles (19.6 million square kilometers). That is about 2.5 times the size of the United States. This 2012 NOAA and NASA report reported on "the second smallest seasonal ozone hole in 20 years averaged size of the ozone hole was 6.9 million square miles (17.9 million square kilometers)." In 2016, the maximum extent of the hole in the ozone layer was reported to be 8.9 million square miles (22.2 million square km). That is larger by 2 million square miles. This despite global efforts to reduce the man-made chlorine and bromine found in chlorofluorocarbons (CFCs), compounds used as refrigerants. These reduction efforts have been in place since the 1987 Montreal Protocol initiated the phase-out of these chemicals. This science report from January 2018 speaks of the "healing" of the Earth's ozone layer, as if humans had been instrumental in achieving that feat. Note that the 2018 articles does not cite the present size, so there is no basis of comparison to the 2012 report. We are expected to believe this assertion of "healing" without being presented with the pertinent data. 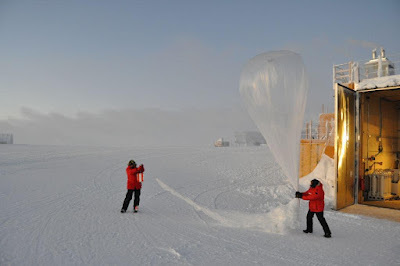 Looking at the data as a whole, it appears that the ozone levels at the South Pole continue to plummet every Antarctic spring as a coincidence of natural environmental factors. When it comes to factors that influence Earth's climate, always double check the data. Claims of human induced catastrophes are often inflated. "Hundreds of millions of dollars that have gone into the expensive climate modelling enterprise has all but destroyed governmental funding of research into natural sources of climate change. For years the modelers have maintained that there is no such thing as natural climate change…yet they now, ironically, have to invoke natural climate forces to explain why surface warming has essentially stopped in the last 15 years!" "Nobody is interested in solutions if they don't think there's a problem. Given that starting point, I believe it is appropriate to have an over-representation of factual presentations on how dangerous (global warming) is, as a predicate for opening up the audience to listen to what the solutions are.... --- Al Gore, chairman and co-founder of Generation Investment Management, a London-based business that sells carbon credits." Related reading: Is the Sun driving ozone and changing the climate? ; On the Cloud Thermostat Hypothesis by Dr. Roy Spencer. Global warming activists hate this man. Why? His paradigm for understanding climate cycles is based on empirical evidence. Corbyn encourages people to double check science reports related to climate.